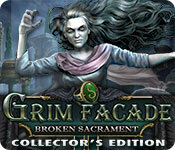 Grim Facade: Broken Sacrament Collector's Edition is rated 3.9 out of 5 by 22. Rated 5 out of 5 by radarsweet from Best Grim Facade Game Yet! I loved this game from the moment I started playing! It takes place on a stormy weather, tempest raging island with a greedy boatman who doesn't do or give anything for free. The voice-overs in this game are very well done. The graphics are really good as well, so whenever you're outside, the rain is pouring down. You can customize your settings for game play (i.e. hint time, skip time). The HOG's were pretty typical of the Grim Facade series; a few hunt & click, a few find the matching item. The mini-games were well placed in the game, & you can choose to play in difficult or casual mode. I loved the one where you have to row your boat through a darkened maze! I felt that there was a good mash-up in them so you don't get stuck doing the same old mini's over again. Some were relatively simple, others a bit more complex. There is a jump map, which is very handy because there are a lot of scenes & a lot of moving back & forth between them. The collectibles are very easy to find & collect; you do have to play the bonus game at the end to get them all. All in all, this is one of the BEST games I've played in a very long time. I'm an old-timer of BF, I have over 300 games, & I'd put this gem right at the top of my list. Rated 5 out of 5 by MrsBen from OH MY GOSH!! WHAT A WONDERFUL GAME! This game has everything that's good! It's mind-blowing!! The play is smooth, responsive and fairly intuitive, the graphics are out of this world beautiful and the music is very appropriate for what you are viewing. It makes chills go up my spine to play GRIM FACADE: BROKEN SACRAMENT and I can't wait to get deeper into it!! You will LOVE it!!!! Rated 5 out of 5 by game_crazy from Great game Couple hiccups but worked out.. Rated 5 out of 5 by gyanda from Very entertaining After so many new games, who weren't for me, i am happy that this one is. It has an interesting storyline, great graphics and it has lots of mini-games, which take just the right amount of time not to get bored or use the skip-button. I was very glad that finally there is a new game out, which is not trying to change the whole history of HO-games, but just does what it should: it entertains. A lot. And i am thankful for this!!! Rated 5 out of 5 by 1955raven from Good Creepy Game! Enjoyed this game very much, Great Story, Scenes and puzzles, all excellent! Rated 5 out of 5 by biscuitsmama from BROKEN SACRAMENT IS MY NEW FAVORITE IN THE GRIM FAÇADE SERIES Broken Sacrament is the tenth game in the Grim Façade series that was first introduced in 2011. I loved the first few games in the series but then somehow it took a wrong turn and the subsequent games never quite held the same interest for me as those earlier games. Now with Broken Sacrament, I feel like the series might be back on track since this game is really a lot of fun to play. The storyline of family intrigue and murder is very well-told as you, the detective, try to figure out if the victim died as a result of an accidental fall or if this is instead a case of murder and family greed. The game has some creative and interactive HOP scenes with the inclusion of various types such as matching, list, silhouette, and storybook styles. I enjoyed all of the scenes and found that some of them were even a bit challenging, particularly when I wasn’t exactly certain what needed to be done. The puzzles are excellent and although some might be considered easy they are still a lot of fun. It is terrific that the developer has also given us the ability to choose between hard and casual on many of the puzzles. Some of the puzzles I enjoyed were the waterfall puzzle as well as the door puzzle where we move an eye to the end of a path that has blockers that must be moved before we can proceed. 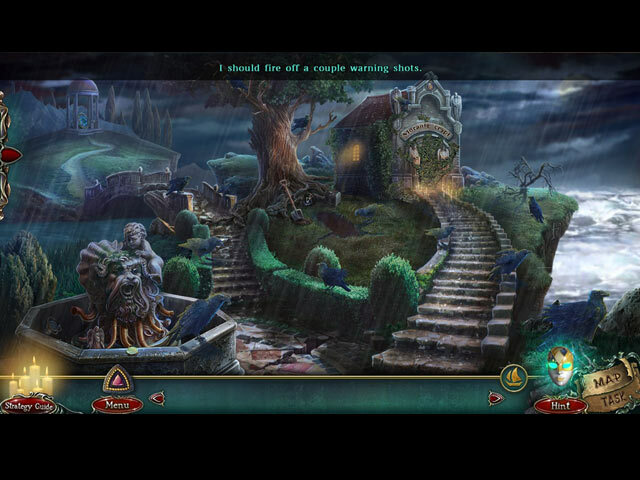 The CE version of the game includes Morphing Objects and Collectible Coins hidden in each scene. Sometimes the Coin Medallions pop right out at me but at other times it was difficult to spot find them. The morphing objects seem to be a bit easier to spot than the coins but I appreciate that the developer finally gave us something special in a CE game. Along with the collectibles and Morphing Objects there are 15 Achievements to earn. There are 14 Concept Art, 12 Wallpapers, and 5 Screensavers. Other extras include 4 Music Tracks and 20 Movies (wow that’s a lot of cut scenes), replay of 14 Mini-Games and 14 HOPS. There is a special extra where we can use the collectible coins to refurbish a yacht. As usual, we have a bonus game and the in-game Strategy Guide. As I mentioned earlier, this is one of the best games I have played in the Grim Façade series. Everything about the game is exactly what I enjoy, with wonderful HOPS and fun mini-games thrown into the mix as I make my way through the storyline. As always, I recommend that you try the demo to see if this is a game you will enjoy. Happy gaming! Rated 5 out of 5 by sunnyglow from “ALL IN THE FAMILY” – THE MORANTES OF MORANTE ISLAND REVIEW BASED ON THE ENTIRE GAME: 6 Chapters plus a Bonus Chapter – Strategy Guide: 39 pages – Time: 4 Hours OVERVIEW/BACKGROUND: On the first of this week’s island adventures, you, Detective are off to investigate the murder of Don Raimondo Morante in his estate on Morante Island. Seemingly, he fell to his death; however, did he have a little help from someone out to kill him? The dearly departed fifty-seven (57) year old, has left behind a pregnant wife, Dora, and adult children, Leon and Adelina (who is engaged). Superstition abounds in this village as most village inhabitants believe the culprit for his demise is the ghost of his first wife of Don Raimondo, Selena. Is she out to exact revenge on the family which she believes may have violated a contract with another family? Has a curse been unleashed or is someone out to claim his or her share of a sizeable inheritance? However, could there be another reason for the murder? There are plenty of suspects within this game. 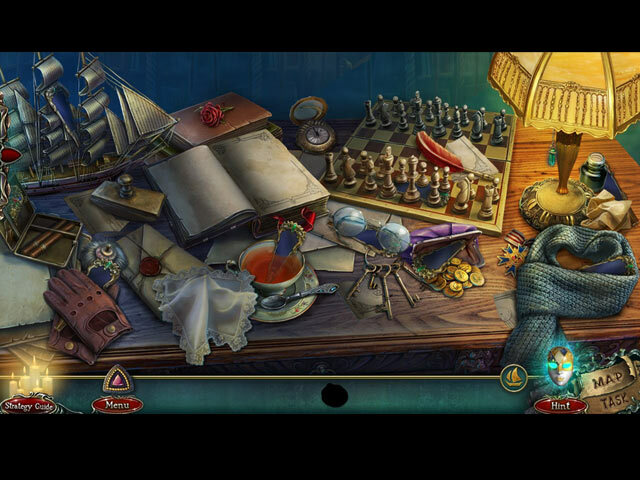 You will need polish off your best sleuthing skills to solve this case. OPINION: This is a short game. I played the entire main game and bonus chapter in four hours. This is a nice easy-breezy game for those who love whodunits. The story behind the game leads you down a slippery path which takes some twists and turns as it leads to a surprise ending. The graphics appear hand-drawn and are breathtaking as usual for AMAX games. The scenes are rich in color and well-portray an Italian estate. The pace is decent, although I did feel it slowed down in some places. I feel this sluggishness rests with the need to search for supplies to create potions and medicines. For me, these are boing activities. As in most AMAX games, you collect coins to purchase items to be used within the game. FILLER – THE REAL HOUSEWIVES OF ITALY: Are you a detective or a housekeeper? I hate games which have the player doing senseless activities which have nothing to do with the theme of the game. Thus, it is in this game. You become a housekeeper to help some guy (who just appears out of the blue) within this game. It feels as if all the activities within this segment are fillers for the game. What does ironing clothes, tidying up a place, setting a table, and cooking dinner have to do with sleuthing? BONUS CHAPTER: The bonus chapter is a sequel to the original game. More family drama awaits you detective as you get involved in the kidnapping of a family member. To write more would spoil the game for those who have not played it. There were few HOP scenes; however, I felt the puzzles were excellent and much better than in the actual game. My favorite puzzles are within this chapter. MECHANICS: You collect coins to purchase items to repair a yacht, the Queen Victoria. Those huge blue disks are easy to locate. There are fifteen (15) achievements to earn. There are twenty-seven (27) morphing letters (G and F) which are also easy to locate. You can replay 14 HOP scenes and 14 puzzles. There are an even amount of HOP scenes and puzzles within this game. HOP SCENES: With the number of mini-HOP scenes, it is difficult to give an exact number of HOP scenes. However, I counted twenty-one (21) within the game. There are some cleverly designed HOP scenes within this game. However, most of the scenes are mini-HOP scenes in which you search for a small number of items, usually pieces of some object. There are the usual lists of items, but there are also quite a few matching scenes and storybook scenes as well in which you search for items listed in green letters while listening to a story about the family. There were two scenes which involve searching for items within three different scenes and then placing those items into the correct location within the three scenes. To me, these were the best scenes of the game. PUZZLES: There are twenty-six (26) puzzles within the game and most are easy. They vary in design and difficulty. However, there are few puzzles which I would consider difficult. There is a new one I have not seen before which has the player removing runes by using six sheets of paper with holes to display the runes to be removed. This is not an easy puzzle and one I will replay as I did not solve it the first time. In the demo there are some puzzles which have the option to be played in a hard or casual mode. However, those options cease to exist within the main game. There is one in the bonus chapter which does allow you this option. SPOILER: HERE ARE SOME OF MY FAVORITE PUZZLES AFTER THE DEMO: A. Matching puzzle. Match up images within books which open when they are selected. B. Sequence puzzle. Click on octagonal stones in the proper sequence to fill in holes within a grid. 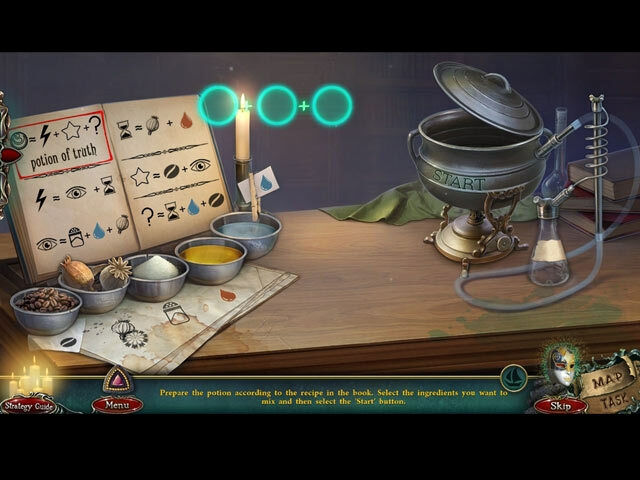 Stones must be chosen in the proper sequence to fill in the holes or you must restart the puzzle. C. Maze puzzle. Traverse a dark maze with only the light of a torch. Your torch will light your way as you search for items to get rid of obstacles in your path. Nicely done and easy to maneuver. D. BONUS CHAPTER: And then there were none! A little toughie! Use 6 sheets of paper with holes cut into them. Place them on a grid with runes. Align all the holes with runes on the grid to remove them. It becomes more difficult as you remove more and more runes. You must remove all runes and that is not easy. E. BONUS CHAPTER: Choice between Casual and Hard. Rotating rings puzzle. Rotate rings to restore a picture. Fairly difficult F. BONUS CHAPTER: Nonogram Puzzle. Place stones on a grid so that the number of stones in each row and column matches the numbers on the left side and top of the grid. Rated 4 out of 5 by pa1555 from Long lasting fun I enjoyed the Collector's Edition and the bonus game was short but very much fun. Looking for morphing items and coins added extra fun to this game. I usually play without sound but had it turned on accidentally during the last 2 minutes of the bonus game. I wish I'd had sound the entire time. The voices were great-not fake, corny or robotic. The music was excellent as were the sound effects. Of course, the graphics were wonderful. Grim Façade never disappoints. Rated 4 out of 5 by rolfes from Would play again! This was a solid game that entertained and had good puzzles that related to the story. The only con was the bonus chapter which had way too many matching games. They sort of phoned that one in. Even the villain's voice was, well, too nice in that final scene. However, that doesn't take away from the main game which was well-paced and fun. Graphics are always good from Grim Facade and the atmosphere is on point. I rarely want to play games again, but I would with this one so that's another point in it's favor.